through the load in the opposite direction (pulling). The output devices arc typically two transistors, each operated class B, one of which conducts only when the input is positive, and the other of which conducts only when the input is negative. 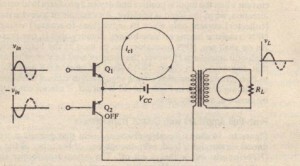 This arrangement is called a class-B, push-pull amplifier and its principle is illustrated in Figure 16-13. 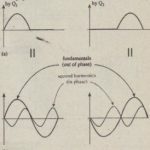 Note in Figure 16-13 that amplifying devices 1 and 2 are driven by equalamplitude, out-of-phase input signals. The signals are identical except for phase. Here we assume that each device conducts only when its input is.positive and is cut/off when its input is negative. 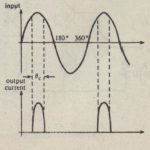 The net effect is that device I produces load current when the input is positive and device 2 produces load current, in the opposite direction, when the input is negative. An example of a device that produces output (collector) current only when its input (base-to-emitter) voltage is positive is an NPN transistor having no base-biasing circuitry, that is, one that is biased at C)Jtoff. ~ we shall see. 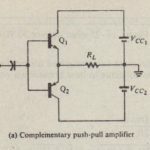 NPN transistors can be used as the output amplifying devices in push-pull amplifiers. 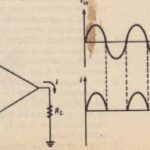 However, the circuitry must be somewhat more elaborate than that diagrammed in Figure 16-13 since we must make provisions for load current to flow through a complete circuit, regardless of current direction. 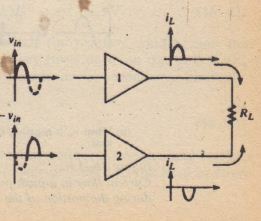 Obviously, when amplifying device 1 in Figure 16-13 is cut off, it cannel conduct current produced by device 2. and vice versa. Figure 16-14 shows a push-pull arrangement that permits current to flow in both directions through a load, even though one or the other of the amplifying devices (NPN transistors) is always cut off. 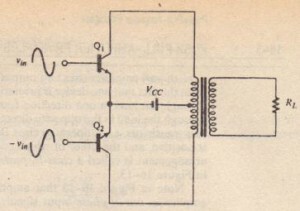 The output transformer shown in the figure is the key component. 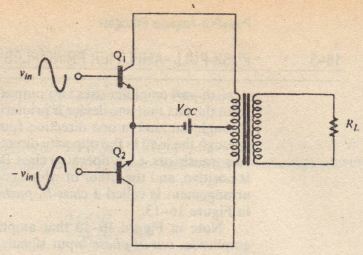 Note that the primary winding is connected between the transistor collectors and that its center tap is connected to the. dc supply, Vcc. The center tap is simply an electrical connection made at the center of the winding. so there are an equal number of turns between each end of the winding and the center tap. 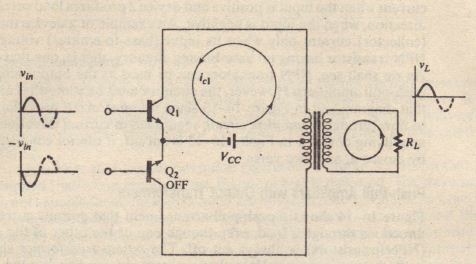 The figure does not show the push-pull driver circuitry, which must produce out-of-phase signals on the bases of O. and 02. We will discuss that circuitry later. (a) When Vi” is positive Qt conducts and 02 is cut off. A counterclockwise current is induced in the load. (b) When V in is negative 02 conducts and Q1 is cut off. A clockwise current is induced in the load. supply varies from 0 to the peak value I/’ every half-cycle. 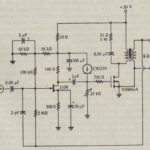 Because the current variation is so large, the power supply used in a push-pull amplifier must he particularly well regulated-that is, it must maintain a constant voltage, independent of current demand. The principal advantage of using a class-B power amplifier is that it is possible to achieve an efficiency greater than that attainable in a class-A amplifier. The improvement in efficiency stems from the fact that no power is dissipated in a transistor during the time intervals that it is cut off. Also like the transformer coupled class-A amplifier there is no external collector resistance that would otherwise consume power. Using calculus, it can be shewn that P,t is maximum when VI’ = 2Vccl1T = 0.636Vcc. We conclude that maximum transistor dissipation does not occur when maximum load power is delivered (Vi’ = Vcc), but at the intermediate level Vi’ = 0.636Vcc. 1. Find the maximum power that can be delivered to the load. 3. Find the power delivered to the load and the power dissipated in each transistor “when transistor power dissipation is maximum. 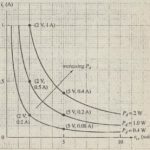 Since 5.46 W is the total power dissipated by both transistors, each· dissipates one-half that amount, or 2.73 W.
The maximum power dissipation in each transistor is then 8.09/2 = 4.05 W.
The preceding example demonstrates some results that are true in general for push-pull amplifiers: (1) When transistor power dissipation is maximum, its value equals the power delivered to the load; and (2) the maximum total transistor power dissipation equals approximately 40% of the maximum power that can be delivered to >l1e load.